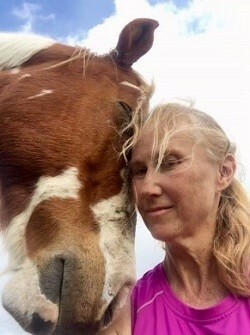 Beverly has a full plate of working full time in Health Promotion at the Vogel Resiliency Center on Ft. Sam Houston in San Antonio and running a nonprofit horse and dog rescue. Her focus and mission in her life, job and her life’s work is showing love and compassion to humans and animals alike and teaching resilience skills to Veterans and their families. Throughout her time in the Air Force, Beverly had always been the Physical Training Leader, the personal trainer, coach and encourager. She had been active all her life between weight lifting, cycling, martial arts, horseback riding and swimming, she rarely sat still. Then, in 2009, a year after returning to the US from a 4 year assignment overseas, Capt. Benson began having severe fatigue, weakness and pain. After many, many tests. Accusations of “faking” and “lying.” And many hours of self-doubt, questioning and prayer, one doctor uttered the words: “Have you been diagnosed with Fibromyalgia?” The referral to Rheumatology was placed and finally, a diagnosis was made. In addition, she was diagnosed with Osteoarthritis of the spine which adds another layer of pain to her day. She recently shared this information with a community group that included a representative from the Arthritis Foundation and an idea was born. Get the word out about all of these programs to help Veterans and their family members who suffer with chronic pain, PTSD and anxiety and she can help others, which, in turn, helps her live a happier, healthier and more fulfilled life. Join Beverly in the fight against arthritis, donate today! Dr. Melissa Mizesko is a board certified pediatric rheumatologist practicing in Corpus Christi, Texas. 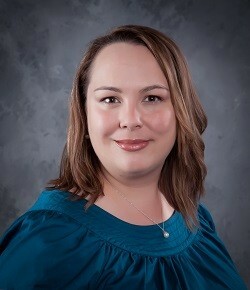 She is a member of the Children’s Physician Services of South Texas group based at Driscoll Children’s Hospital (DCH). She is the only practicing pediatric rheumatologist for much of the South Texas region and sees patients in McAllen, Texas at DCH’s facilities there. She has a background in basic science research, but after coming to Texas, she realized the huge gap in care for patients that cannot travel to Houston, San Antonio or Austin. She has lived in several states for her medical training, including North Carolina, Indiana and Pennsylvania. While she isn’t from Texas originally, she got here as soon as she could. Join Melissa in the fight against arthritis donate today! Sachi Arya is a project manager in Information Services at Valero and lives in San Antonio. Up until about two years ago, Sachi was living a normal life. Sachi was paralyzed by knee pain on a camping trip with his family. An MRI revealed he had osteoarthritis (OA) of the knees. Osteoarthritis occurs when flexible tissue at the ends of bones wears down leading to bone on bone friction causing severe pain, and loss of mobility. His doctor suggested that since Sachi was an IT guy and did not engage in activities like mountain climbing, that he could get knee replacement surgery and at least walk pain free. This struck a chord with Sachi and he decided to challenge himself with activities not normally associated with someone with OA. As a way to raise awareness for osteoarthritis — and defy stereotypes about living with the disease -- Sachi set out to climb Mount Everest. He is working his way to make it happen. To date, Sachi has climbed ten peaks (14,000 feet and up) in Colorado. Sachi has also climbed to the Mount Everest Base Camp and several other peaks in Nepal. He plans to visit Nepal again in November 2019 and climb Mera Peak (21,300 feet). More than 3 million cases of OA are identified per year and second most costly health condition treated at US hospitals in 2013. Sachi considers himself fortunate to be able to work with, and have the support of, a team of doctors and therapists to help him in his fight against osteoarthritis. 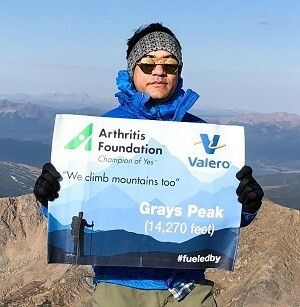 He joined the Arthritis Foundation to help support others who do not have this similar support. Sachi Arya is the adult honoree for this year’s 2018 Jingle Bell Run. He hopes to bring awareness of OA and to raise money to support osteoarthritis patients. Join Sachi Arya in the fight against arthritis, donate today! 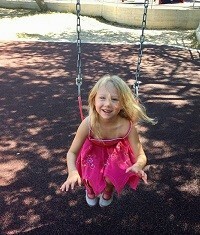 Kinslee is a lively 5-year-old little girl that loves all things that glitter and sparkle. She enjoys playing dress up, singing, and dancing. She likes to shop and has become quite the little fish in the swimming pool, though she would say mermaid. Around 18 months old, Kinslee refused to get out of bed and walk on her own. She cried, appearing to be in pain every morning. Her parents noticed that her knees looked swollen and inflamed. This was in addition to trigger fingers that became contracted as early as 3-4 months of age. Kinslee was referred to a pediatric rheumatologist who diagnosed her with JIA, juvenile idiopathic arthritis. Kinslee’s parents were grateful to connect with other families affected by JIA and for additional resources provided through the Arthritis Foundation. Since her initial diagnosis, Kinslee and her family have participated in the Jingle Bell Run events, as Kinslee has named the team Polka Dot Shopping. After a year of failed treatments of oral medications, weekly injections, and bi-weekly infusions, Kinslee’s rheumatologist helped her parents seek out genetic testing. She was found to have CACP syndrome, which is a genetic mutation of the protein lubricin that helps with lubrication in body cavities like joints. The result is multiple complications: Camptodactyly (permanent bending of fingers/toes), Arthropathy (joint disease), Coxa Vara (structural hip deformity), and Pericarditis (fluid accumulation around the heart). CACP is estimated to occur one in 1-2 million, and is almost always first diagnosed as JIA. Currently, there is no treatment strategy. 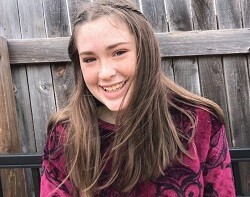 Through her involvement with the Arthritis Foundation, Kinslee and her family hope to raise awareness that kids get arthritis too and other joint related diseases like her rare diagnosis of CACP Syndrome. They hope awareness will help with proper diagnosis and research may lead to finding a cure. Join Kinslee in the fight against arthritis, donate today! Alex is a 15-year-old high school sophomore who lives in Cibolo, TX. She enjoys hanging out with her friends and cannot wait to have her driver’s permit soon. One day, when Alex was 5 years old, a rash appeared on her body. Within months, she had daily fevers, continued rashes and joint pain. She had to go to several different specialists before she was correctly diagnosed with Systemic Juvenile Idiopathic Arthritis (JIA) at age 6. Her autoinflammatory disease affects not only her joints, but also organs such as the heart, lungs, spleen and liver. Alex has taken several medications since her diagnosis, including steroids, pain medications, chemotherapy, and biologic medications. When one biologic stops being effective, she has to try another one. She has also developed fibromyalgia as a result of all her high daily pain levels. She has had to miss out on many activities with her friends due to the pain and fatigue of her disease. Alex is one of 300,000 children in the United States who have Juvenile Arthritis. Her form of arthritis, Systemic JIA, is the most rare, involving approximately 10% of those cases. Approximately 25,000 children in Texas suffer from JA. Please join us in raising funds to find a cure. No child should have to live in pain! Join Alex Greiner in the fight against arthritis, donate today!